What is freedom school, and who can attend? Freedom school is a school were African-American males and females from the age of one year and older can attend. Come see what we have to offer you at freedom school. In freedom school one can and will learn about their culture, Afrikan and African-American history, Afrikan achievements and contributions to the world civilization. It also teaches one about his/her state of mind, attitudes, opinions and sensitivities. If your son/daughter has trouble with any one subject or subjects in school, freedom school offers tutorial services for all grade levels. Remember, "a mind is a terrible thing to waste"education is knowledge and knowledge is power without which our young people are lost. What is the birth sisters program? The birth sisters program is a program that teaches Afrikan and Afrikan American histories and cultures as a tool to reduce in for mortality. It teaches women to assist expecting mothers and mothers of infants one year or less with the stages in the development of an Afrikan woman. All educational components are designed to reduce infant mortality so as to reduce racial disparities in African-Americans infant mortality. By changing the thinking feelings, and actions of the mother toward herself, her pregnancy, and the newborn. Juneteenth is a holiday in the United States that commemorates the announcement of the abolition of slavery in the U.S. state of Texas in June 1865, and more generally the emancipation of African-American slaves throughout the Confederate South. Celebrated on June 19th. Odyssey Village and The Health Awareness Center help sponsor and promote Flint's Juneteenth Celebration held over several days in downtown Flint. 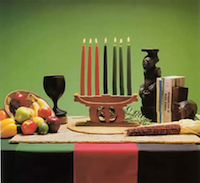 Kwanzaa is a week-long celebration honoring African heritage in African-American culture, and is observed from December 26 to January 1, culminating in a feast and gift-giving. It was created by Maulana Karenga, and was first celebrated in 1966–67. Odyssey Village Holds a Kwanzaa celebration in its Recovery Lounge at 528 MLK in Flint. more information on Odyssey's Kwanzaa Celebration.